Even though The Blair Witch Project did not invent or perfect the found footage aesthetic, whereby a fictional story is presented as if it were a real event recorded by the characters experiencing it, it did much to establish the style in the popular consciousness, and as a viable means for film-makers to make genre films for money that usually wouldn't cover the catering budget on a major Hollywood production. There have been plenty who have tried to replicate the style, not to mention phenomenal success, of Blair Witch since 1999, particularly since Oren Peli's Paranormal Activity and its sequels actually managed to do just that, and the majority of the found footage films from this time have been spins on conventional horror films, a development which has resulted in films of wildly varying quality (though that variance more often than not is between "not completely awful" and "just about preferable to eye surgery"). Amongst the ghost and/or exorcism movies that have used the style, some film-makers have used it to offer novel twists on other genres. Most notably, Matt Reeves' Cloverfield used its worms' eye view of a monster movie to exhilarating effect, working both as a new way of telling a pretty old story, and as well as acting as an evocation of the horrors of 9/11 within a work of popular entertainment, much as Gojira recontextualised the devastation of Hiroshima and Nagasaki for Japanese audiences in the 1950s. In a similar vein, Josh Trank's Chronicle uses found footage as a means of providing a seemingly new take on a story type that has become painfully familiar by this point: the superhero origin story. 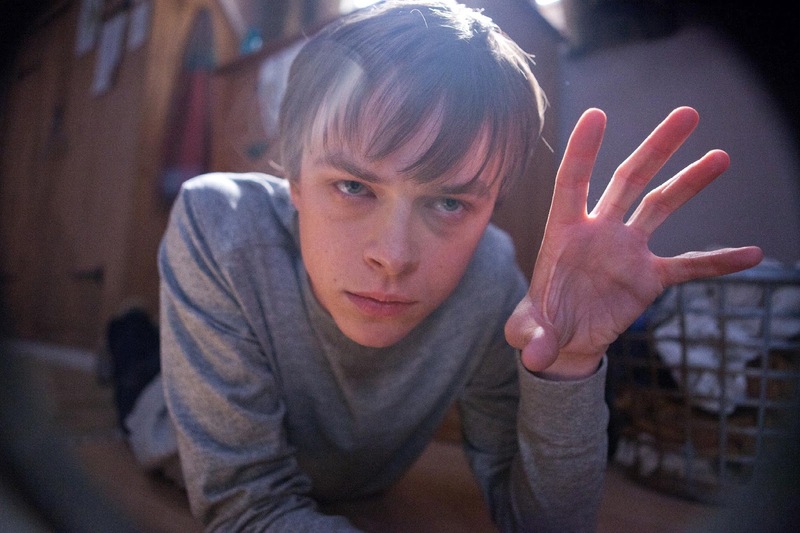 Andrew Detmer (Dane DeHaan) is a troubled teenager who decides to use his video camera to create a record of the many humiliations and indignities that make up his sad existence. He records the moments when his drunk father (Michael Kelly) gets physically violent towards him, the moments when he is bullied at school, and the many tiny ways in which he is rejected by the people around him. Seemingly his only friend is his cousin, Matt (Alex Russell), a more philosophical person than his relative, who invites Andrew to a rave in the hopes of breaking him out of his shell. Once there, they meet Steve (Michael B. Jordan), the most popular kid at school, and the three drunkenly stumble across a weird green glowing rock hidden in a cave. They touch it, and soon find that they can move things with their minds, that they have enhanced strength, and that they can fly. But using their powers comes at a physical and psychological cost, and it soon becomes apparent that one of the boys is having more trouble coping with his newfound abilities than the others. Chronicle's greatest strengths are its cast, who all feel like realistic teenagers and have a chemistry that makes their initial friendship and later antagonism feel very truthful, and the script, by Max (son of John) Landis, which takes its time establishing the characters and focusing on how they learn to use their powers. Since it is not based on a well-known or existing property, Chronicle has to do a lot of heavy lifting to explain what the powers actually do, as well as how the characters choose to use them. Specifically, the film is concerned with the way in which they use them to play pranks on people and generally piss around, much as real teenagers would do if given the ability to move a car with their mind. The best stretch of the film by far finds the three pushing each others' limits and reveling in the freedom their powers give them, especially since this leads right into the tension and tragedy that drive the last act of the film, making for a very satisfying narrative contrast. Despite the strength of its content, Chronicle is ultimately hobbled by its style, which becomes so distracting at times that it shatters the illusion of the film. (This is admittedly something of a Catch-22 for the film, though, since it's hard to imagine it ever getting green lit without the found footage aspect, even if it is the film's greatest weakness. This is not necessarily a comment on the script, which is solid, but the fact that it is hard to imagine a studio putting money into a superhero movie not based on an existing property without a gimmick like the found footage angle.) Whilst the found footage aesthetic works initially as a quick way of introducing the characters, and even gets used nicely as a way of showing how Andrew's powers have developed when he uses his mind to move the camera, it gradually becomes a hindrance as Trank and Landis try to think of increasingly clunky justifications for why the characters are still filming. This is most noticeable in the climax when a fight between two characters is captured by camera-phones of passersby which just so happen to get caught up in the psychic whirlwind in such a way as to capture the fight from a number of dramatic angles, but even fairly early on in the film they introduce the character of Casey (Ashley Hinshaw), a blogger who records everything on her own camera, as both a love interest for Matt and as a way of introducing a camera for scenes in which Andrew isn't present. This artificiality goes against the verisimilitude that the film tries to create, and ultimately break the intimacy that it manages to create in early going. It's a terrible shame that the style of the film winds up being so distracting and harmful, because the substance deserves better. A good script, good performances and a refreshingly exuberant take on the superhero genre make it more than worthwhile, but the found footage aspect keeps it earthbound where otherwise it might have soared.